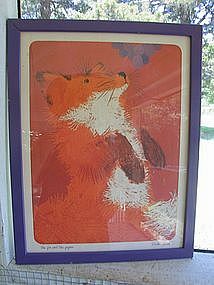 Vintage print from Scafa Tornabene Publishing Company and dated 1985. 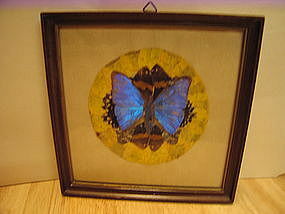 The frame measurements are 15 1/2 x 12 1/2 inches. It was not manufactured with a hanging device. There is minor wear to the wooden frame. I need your zip code to calculate the postage. 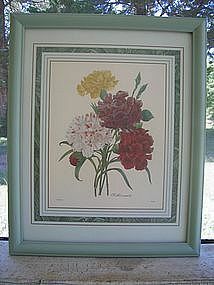 Vintage print framed with faux wicker. It features dogwood, forsythia and assorted blossoms. It measures 18 1/2 x 10 inches. Slight soiling to the print, which is not under glass. It is is marked Dart Ind. 1977, made in USA. I need your zip code to calculate the postage. 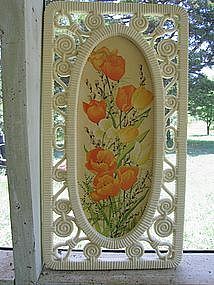 Vintage resin/syrocco wicker framed print. It is marked as Dart Ind., 1977, made in USA 3337. It measures 18 1/2 x 10 inches. This print is framed without glass and I am sure there is slight soiling to the surface, although it can't be seen. I need your zip code to calculate the postage. 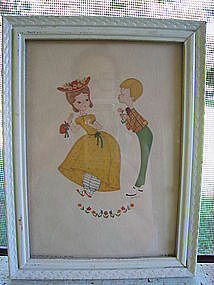 This vintage print has been professionally matted and framed. The frame measurements are 15 1/4 x 12 3/4 inches. There are a few tiny areas of damage to the wooden frame from storage. There is a lot of glare in the glass and do not mistake as damage. There are other prints in the fable series available for purchase. I need your zip code to calculate the postage. Vintage professionally matted and framed print. 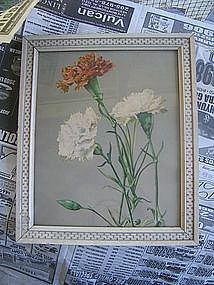 The frame measures 15 1/4 x 12 3/4 inches. There are some tiny dots of yellow paint on the frame. I need your zip code to calculate the postage. 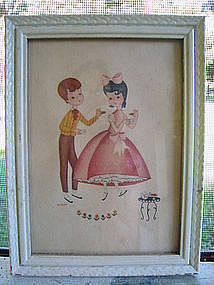 Vintage print that has been professionally matted and framed. 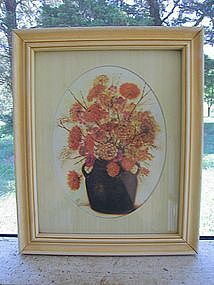 The frame measures 15 1/4 x 12 3/4 inches. There is some minor damage to the frame finish and some small rips to the paper sealing on the back. Several other prints in the fable series are available and priced individually. I need your zip code to calculate the postage. Framed kitchen sampler in what looks like a plastic canvas and yarn. It is professionally framed and sealed. It measures 9 1/2 x 91/2 inches. There is some loss of the finish to the frame. The matching banana sampler is available and priced individually. I need your zip code to calculate the postage. 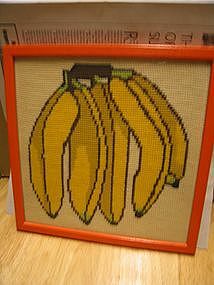 This appears to be a sampler made of plastic canvas and yarn, and I am not sure of what kind of craft this would be called. It has been professionally framed and sealed by shop in Mobile, Alabama. 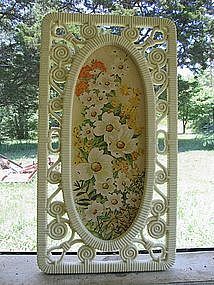 It measures approximately 9 1/2 x 9 1/2 inches. Minor wear to the frame. 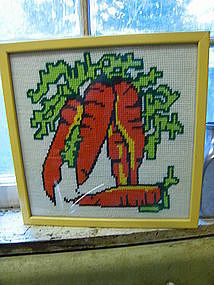 I have a companion piece of a bunch of carrots available for purchase and priced individually. I need your zip code to calculate the postage. Marked as 1997 Anne Geddes Portal Publications, ARV Litho 747 in USA. 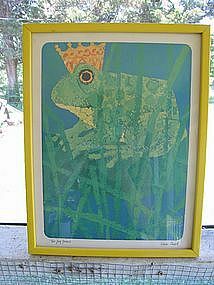 There is no damage to the print, frame or glass, other than minor wear to the frame. My daughter's name has been marked over on the back covering. I need your zip code to calculate the postage. 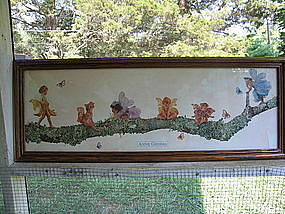 Vintage print measuring 15 3/4 x 7 inches. There is wear to the frame and print and the print needs to be reset in the frame. A matching print of girl with guitar is available. I need the zip code to calculate the postage. 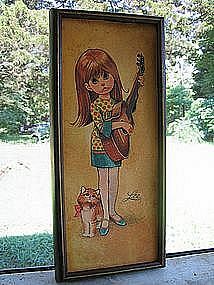 Vintage "big eyed" girl print. 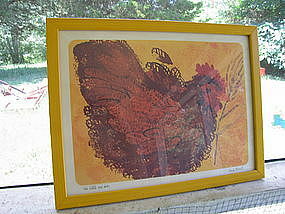 It is a cardboard print framed without glass. The measurements are 15 3/4 x 7 inches. Minor wear and the print should be reset. 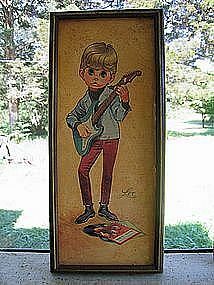 The companion print of a little boy playing guitar is available and priced individually. I need your zip code to calculate the postage. 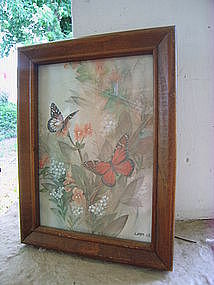 Lena Liu butterfly print in wooden frame. It measures 7 7/8 x 5 7/8 inches. Minor wear to the frame. I have an another print with similar subject matter in the same frame, available for purchase. I need your zip code to calculate the postage. I hesitate to call this a vintage print, but it is not new. 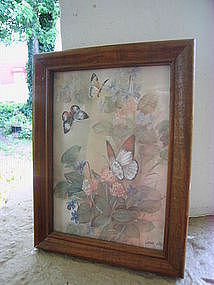 The wooden frame measures 7 7/8 x 5 7/8 inches. Minor wear to the frame. I need your zip code to calculate the postage.